Political analysts do not expect any increase in political competition in Russia in the nearest future despite a slew of plans to form new political parties. With no serious challengers, experts believe that the ruling United Russia party, now with Prime Minister Dmitry Medvedev as its chairman, is unlikely to experience real reforms regardless of President Vladimir Putin's call for change within the flagging organization. In late May, the Russian media reported the launch of several new political projects. First, Vasily Yakemenko, the founder of pro-Kremlin youth group Nashi announced plans to create a party called "Party of Power." Yakemenko said that both opposition activists and Putin loyalists would be welcome in the project. He implied that his party will be in competition with United Russia, whose victory in the December parliamentary elections led to the biggest anti-government street protests seen in Russia over the last decade. Then, Russian billionaire and New Jersey Nets owner Mikhail Prokhorov, who has absent from Russian politics since his impressive debut in the March presidential elections, signaled that he was going to return to politics, writing in his blog, “We begin to act!" Many analysts interpreted the comment as a sign that Prokhorov would finally proceed with the creation of his own party, which he had pledged to establish after the presidential elections. Experts, however, argue that even if realized, none of these projects would add any competitiveness to the already dull political party scene in Russia. Political analyst Dmitry Orlov said that Yakemenko is naïve to think that he can receive support of large number of people, not to mention the opposition. Orlov points out that the Nashi founder has a well-established, mostly negative, image and it would be impossible to change it. For example, Yakemenko has been accused of being behind several high-profile attacks on journalists in recent years and has also been involved in a number of phone and e-mail hacking scandals. Political analysts Boris Makarenko and Mikhail Remizov in turn argue that Yakemenko’s party project was launched by the Kremlin as a response to the growing opposition in Russia, demonstrated most recently by a new wave of street protests in May. Makarenko suggests that Yakemenko’s "Party of Power" is intended to become a typical spoiler party formed to draw votes away from opposition. Remizov believes that the Kremlin is trying to use Yakemenko to redirect growing protest into a controlled sphere of party politics. Orlov thinks that the Nashi party could be an attempt by the youth movement to find a new format of political activity given the changes in the political system. “Every significant political force now is trying to get its own party, its own legal roof if you want,” said Orlov. As for Prokhorov, analysts are divided over his motivations. Remizov argues that the billionaire’s plans reveal his ties to the Kremlin. “I think that his behavior - when he first terminates his political activity when the situation seems to have stabilized and then turns it on again when protests have returned - characterizes him not just as a Kremlin project but as a project on a short leash,” Remizov said. Makarenko and Orlov, however, disagree with this point of view, arguing that Prokhorov has simply realized that he should not be putting off the creation of his party for too long. Experts believe that with the continuous absence of real political competition in the country, Medvedev, who succeeded Putin as chairman of United Russia and vowed to reform the organization, has in fact no real incentives to significantly change the party. 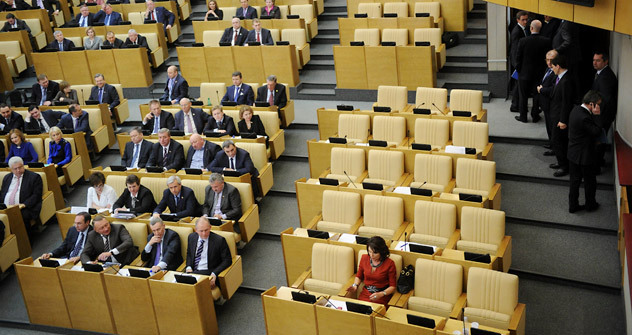 Even though United Russia won far fewer votes in the December State Duma elections than in the 2007 vote, it remains the country’s dominant party. In a speech on May 27, Medvedev called for elections of party leaders at all levels through direct secret ballots and the creation of a single five-year term for party leaders at all levels. The prime minister also insisted on annual rotation. Experts, however, believe these requests can bring only superficial change. “These reforms that have been announced are absolutely imitating. The party will change its character only under political competition. United Russia will change only if there is real struggle with real political opponents for the votes of the electorate,” said Makarenko. Orlov also believes that United Russia will not significantly change its political positioning. The analyst said that with Medvedev as its chairman, the party may only become “a little bit” more liberal.